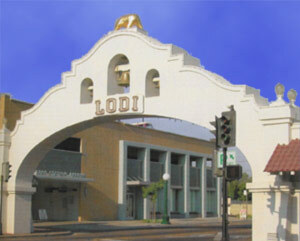 Mention Lodi and baby boomers picture a town so dull, the band Credence Clearwater Revival once wrote a song about it. But these days, being “Stuck in Lodi, again” is a good thing. Less than 90 minutes from Alameda, Lodi is a world apart from Stockton and other Central Valley neighbors. “There’s a spike in home prices when you get to Lodi,” one realtor told me, and the reason is plain to see. The town is as neat as a pin–with a thriving downtown shopping district and its own wine country. Head north on I-5, past the farms and the truck stops and the endless miles of fast food outlets, and just north of Stockton you’ll see the landscape change. Turn east onto Highway 12, and vineyards and fruit stands now dot the countryside, with freshly painted homes tucked neatly between acres of farmland. Just 7 miles away–Lodi starts to draw you in. Nestled along the Mokulemne River, the town is a shady respite for sun-baked Delta travelers. Forty wineries make their home here, including Woodbridge and Michael David–known for its popular “7 Deadly Zins”. Your first stop should be the new Lodi Wine and Visitor’s Center, where you can taste top local wines, learn about the region and pick up a wine trail map. Unlike Napa, Sonoma and even Livermore–the wine trail here is a pastoral delight–devoid of traffic and crowds. It’s the quintessential country road, with acres of old Zinfandel vines and enormous Valley Oaks. Just minutes from the vineyards is the downtown of my dreams. With a mission-style arch at its entrance, The heart of Lodi is lined with wonderful shops and bakeries and a bustling new multiplex theater. Farmers bring fresh organic vegetables to the open air market and they’re snapped up in minutes. The bus and train station nearby are immaculate–and within walking distance of the shops. This is a town with strong German roots and a community pride that’s contagious. No trip to Lodi would be complete without a visit to the town’s premier property–Wine and Roses Hotel. It’s a beautiful country estate with acres of flowers and manicured lawns and plush, Victorian rooms. It’s easy to see why weddings are so popular here, but it’s also the local’s favorite. The restaurant is exceptional, with much of the food grown organically in the fertile fields nearby. Even the duck is raised locally, and the flavor rivals anything you’ll find in the Bay Area’s top restaurants. What’s different is the way you feel when you’re here–like an old friend. Owner Russ Munson sees to this, stopping by each table to greet his guests. The night I was there, I was even invited to sing at the piano–with the wonderful Rudy Tenio, who’d been playing music all day in the cool delta breeze. Hours after his “gig” had ended, he obviously felt the way I did–that this place was too special to leave. Being in Lodi was a good thing. I can’t wait to be “stuck” there, again. For more information on Lodi http://www.visitlodi.com , the Lodi Wine and Visitor’s Center at www.lodiwine.com, The Lodi Conference & Visitors Bureau at (209) 365-1193, or Wine & Roses Hotel at (209) 334-6988.